In early 1990 at CERN headquarters in Geneva, Switzerland, Tim Berners-Lee and Robert Cailliau published a formal proposal to build a “Hypertext project” called “WorldWideWeb” as a “web” of “hypertext documents” to be viewed by “browsers”. Following development work the pair introduced the proposal to a wider audience in December, and on August 6, 1991, 20 years ago, the World Wide Web officially opened for business on the internet. On that day Berners-Lee posted the first web page — a short summary of the World Wide Web project on the alt.hypertext newsgroup. The page authored by Tim Berners-Lee was http://info.cern.ch/hypertext/WWW/TheProject.html. A later version on the page can be found here. The page described Berners-Lee’s summary of a project for organizing information on a computer network using a web or links. In fact, the the effort was originally coined “Mesh”, but later became the “World Wide Web”. The first photograph on the web was uploaded by Berners-Lee in 1992, an image of the CERN house band Les Horribles Cernettes. Twenty years on, one website alone — Flickr – hosts around 5.75 billion images. theDiagonal doesn’t normally post “newsy” items. So, we are making an exception in this case for two reasons: first, the “web” wasn’t around in 1989 so we wouldn’t have been able to post a news release on our blog announcing its birth; second, in 1989 Tim Berners-Lee’s then manager waved off his proposal with a “Vague, but exciting” annotation, so without the benefit of the hindsight we now have and lacking in foresight that we so desire, we may just have dismissed it. The rest, as they say “is history”. Web inventor Tim Berners-Lee today returned to the birthplace of his brainchild, 20 years after submitting his paper ‘Information Management: A Proposal’ to his manager Mike Sendall in March 1989. By writing the words ‘Vague, but exciting’ on the document’s cover, and giving Berners-Lee the go-ahead to continue, Sendall signed into existence the information revolution of our time: the World Wide Web. 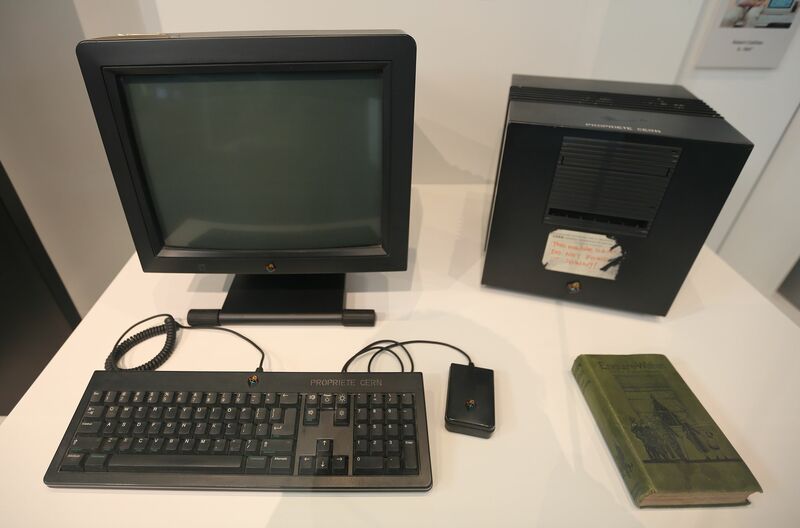 In September the following year, Berners-Lee took delivery of a computer called a NeXT cube, and by December 1990 the Web was up and running, albeit between just a couple of computers at CERN*. Today’s event takes a look back at some of the early history, and pre-history, of the World Wide Web at CERN, includes a keynote speech from Tim Berners-Lee, and concludes with a series of talks from some of today’s Web pioneers. The World Wide Web is undoubtedly the most well known spin-off from CERN, but it’s not the only one. Technologies developed at CERN have found applications in domains as varied as solar energy collection and medical imaging.